Two out of the five men being prosecuted by the Nigerian government for unlawful importation of 661 pump-action rifles into the country have indicated their intention to enter into a plea bargain for a soft-landing. The defendants – Mahmud Hassan, Oscar Okafor, Donatus Achinulo, Matthew Okoye, said to be at large, and Salihu Danjuma – had been arraigned by the Attorney-General of the Federation, AGF on June 14 before the Federal High Court in Lagos. They had all pleaded not guilty to the eight charges pressed against them, while the trial judge, Ayokunle Faji, refused their bail applications in view of the gravity of the charges levelled against them. The matter was subsequently adjourned until September 25 for trial. However, at the resumed proceedings on Monday, the second and third defendants, Oscar Okafor and Donatus Achinulo, respectively, who had changed their lawyers, indicated their intentions to change their plea from not guilty to guilty. The application was made orally on behalf of Mr. Okafor by Rotimi Jacobs, his new lawyer, and on behalf of Mr. Achinulo by another lawyer, Paul Ananaba. However, the judge directed the defendants to notify the AGF of their decision. The matter was subsequently adjourned until September 26. 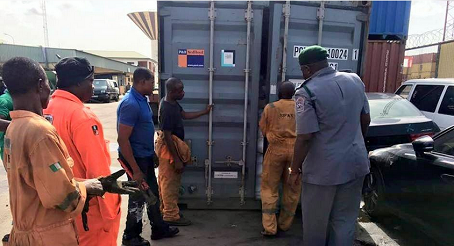 In the charges, the AGF said the accused persons brought 661 pump-action rifles into the country from Turkey through the Apapa Port in Lagos, using a 40-feet container, which they falsely claimed contained steel doors. According to the prosecution, in order to evade payment of customs duty, the accused allegedly forged a bill of lading issued at Istanbul on January 9, 2017, falsely claiming that it was issued at Shanghai, China. In the forged bill of lading, they allegedly filled “steel door” as the content of the container instead of rifles.